LongLocks Salon › Hair Types › So Straight › FAVORITE DEEP CONDITIONING/STRAIGHT HAIR? I was wondering what your favorite deep conditioning treatments are and also if you use leave in products and hairspray on your straight hair? My hair is mostly straight but it will scrunch up with a lot of products, which I don't like to use so- I am thinking of dropping the curly girl routine but keeping the CO washes and let it hang straight as it will. I'd love to hear others hair care/styling routines! 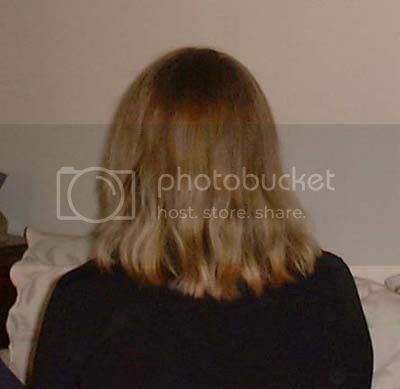 Re: FAVORITE DEEP CONDITIONING/STRAIGHT HAIR? I use just a bit of whatever conditioner I am using at the time as a leave-in conditioner. This helps with detangling and minimizes some of the flyaways I get with my fine hair. I usually just let my hair air dry, but will put it in a damp bun if I have to go out when my hair is still damp. Thanks bikerbraid! Maybe I'm trying to make this more compicated than it needs to be. I like that, too. It's really helped my hair. Bikerbraid, how much conditioner do you use as a leave-in? How do you apply it? I'm worried about using too much. I don't use very much. First I try to get as much water out of my hair as possible, but I don't towel dry. I then work a small amount of conditioner through my hair starting with the ends and working up to the neck. I don't have a real thick pony tail, my hair is to my hips. I use about a tablespoon of conditioner. L'oreal Kerastase Soleil is also a good brand for a deep conditioner-very moisturizing. These are the silicone-free ones,good conditioners with cones are Aussie Moist or John Frieda Beach Blonde. At the moment I use no leave-ins,but I liked the Beauty without Cruelty leave-in a lot in the past. I never use hairspray/gel/mousse. I've been using the Biolage Conditioning Balm regularly for a while now and it is still the best thing I've ever found for my hair. I even use a tiny dab as a leave-in and it is not too heavy. And it smells so good. I've got to go back and reread the posts here and see if I can find a second conditioner that I can rotate. kerastase without cones??? you're sure (cuze their intensive mask sure is full of them!) ??? I've had trouble finding the L'Oreal Kerastase Soleil Conditioner online. Not sure why... ??? But you are right, some of their other conditioners do have cones. i know that kerastase, i think it has this nice fushia wrapping but i always thought all of their stuff is full of cones ... i'll check it out. Please let us know what you find out! Thanks for checking it out! i <3 the garnier fructis deep conditioner just pick ur hair type from the ones they have !!!!! luv yaz all xoxo !!!!!!!!! I have XZ deep conditioner, and that seems to be OK, but when I really want to pamper my hair, I soak it in jojoba oil-rosemary EO mix. That does wonders to my hair.